“The consultant’s report on how to save Prince William County’s rural area will be given early next year to the Board of County Supervisors and will be outlined at a public meeting. That was the word from Ray Utz, the county’s director of long range planning, shortly before presstime. ” ‘We expect at that public meeting we’ll get mostly results and recommendations,’ Utz noted. He added he thinks Environmental Resource Management (ERM), Annapolis, MD, the consultant hired by the county, will present ‘a pallet of recommendations’ for supervisors’ consideration. The board could accept any, all, or none of the proposals. “A public workshop on the Rural Preservation Study was held Dec. 7 at the Prince William Campus of George Mason University in Manassas. Topics covered included land preservation, rural character and the rural economy in the 117,000-acre rural area. “The county figures Daniels used show 52 percent of the county in the rural area or Rural Crescent. There are about 7,570 homes in that area, with capacity for 3,700 more homes built on ten-acre lots. Public water is allowed in the rural rea, but sewers generally are not. “Daniels, a professor of city and regional planning at the University of Pennsylvania, discussed land preservation options and opportunities during the day-long workshop. He reported land preservation options include the purchase of development rights (PDR), donation of a conservation easement, bargain sale of development rights, transfer of development rights (TDR) and cluster development with mandatory preservation of open space. “The consultant explained that under a PDR, a landowner could voluntarily sever his right to develop his land and then sell the development right to a private nonprofit land trust or government agency. Restrictions would be replaced on the land through a recorded conservation easement, which usually is permnanent and runs with the land. 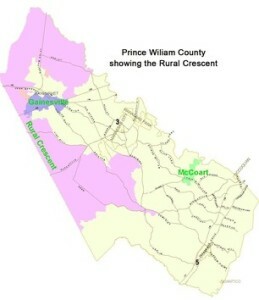 “Daniels said Virginia has a farmland preservation program, which provides money to counties to buy development rights. A professional appraiser sets the value of the development right. Federal money also is available through the Natural Resources Conservation Service (NRCS). The Readiness and Environmental Protection Integration (REPI) program of the Department of Defense also has funds available to buy land near military bases. “The speaker added, in a PDR, the landowner ges cash, which is taxed as a captial gain at a maximum 15 percent, not as ordinary income. The county gets preserved land to manage growth and save environmental quality. “A landowner donating a conservation easement would get a federal income tax deduction of up to 50 percent of adjusted gross income for up to 16 years and a possible estate tax benefit. He also could get a state income tax credit of 40 percent of the value of the donated easement. He could claim up to $100,000 per year for up to ten years and also could sell some or all of the tax credits. From 2000 to 2012, some 591,612 acres in the commonwealth were saved through 2,774 easement donations, Daniels observed. “TDRs are permitted in Virginia, the speaker explained. The county or jurisdiction designates a sending area and a receiving area where more development would take place. Landowners would get development credits, and developers would buy the credits to build at a density higher than allowed. A conservation easement is put on land in the sending area when all the develoment credits are sold. ” ‘The TDR program is a developer’s dream,’ Daniels noted. “Daniels also reported TDRs could be done with commercial properties, which increases a county’s tax base without adding children to its school system. ” ‘The folks who took the survey are the ones interested,’ he contended. “Graham told his session there was a broad mix of responses on what development residents would like to see in the rural area, and that many respondents felt no changes are needed, or that they are uncertain about the benefits of any changes. “Some of the survey respondents want to see parks, camps, preserves, wildlife tours, wineries, horseback riding trails, apple orchards and corn mazes. They believed wholesale nurseries should be encouraged, but frowned on retail nurseries as traffic magnets. Other believe access to affordable Internet service is needed, and that arts, small shops and culture should be encouraged. “There was general support in the survey for businesses supporting or related to farming, recreation and the environment. Small businesses, including home-based were favored over large or heavy industrial uses.